In 2015, more than 16.5 million new vehicles were sold, the highest since 2006. However, according to Edmunds and Kelley Blue Book, 25 percent of all new cars weren’t actually “sold,” instead they were leased. Leases generally run for three to four years. At the end of the lease, you’ll have two options: either buy the car for the residual value (a dollar value that was calculated and agreed to at the beginning of the lease) or walk away from the lease. Option 1: Buy the leased vehicle. The most important part of any lease is the residual value. If your car is worth more on the open market than the residual value, you might consider buying the vehicle and keeping it. Or you can buy the car, sell it, and pocket the difference. Option 2: Buy a new vehicle. If you don’t have the money to buy the leased car outright, consider rolling the security deposit you put down for the current car into a new car. This will reduce the amount of money you’ll need to come up with to get into a new lease. Step 1: Check your mileage. About three months before the end of the lease, check your mileage. Most three-year leases allow for 12,000 miles a year. By the time you turn in the car, the mileage should be 36,000 miles or under. If you’re over the mileage cap, be prepared to pay an extra fee per mile, for the number of miles which are over the maximum miles allowed. Step 2: Avoid increasing the mileage. If you think you might exceed the mileage cap by the time the lease is over, cut down on driving the car for a while. The excessive mileage penalties add up very quickly once you go over the mileage cap. Step 3: Detail your car. Get your car detailed inside and out before you take it in for the inspection. Be very thorough and make your car look its best. All cars experience normal wear and tear. However, after a lease ends, most dealers want to do as little as possible to the car, and resell it quickly. Step 1: Follow the pre-inspection checklist. Ensure that you pay particular attention to the following factors before the inspection. Step 2: Fix any issues. Get a certified mechanic to fix any issues that you notice in the pre-inspection checking process. Step 1: Collect both sets of keys. If you were given two sets of keys at the start of the lease, ensure that you return two sets of keys. Step 2: Collect the original floor mats. If you replaced the floor mats, return the originals back to the leasing company. Step 3: Prepare all repair kits and manuals for return. You need to return cargo covers, third row seats, lug nut locks, spare tires, jacks, repair kits, and owners manuals at the end of a lease. Step 4: Undo any modifications. Undo any modifications that you have made and check that your car is in the condition you received it before you return the car, or else you’ll get charged for undoing your upgrades. Leasing your vehicle gives you a lot of flexibility at the end of the lease term. You can choose to buy out your current leased vehicle, lease another car (either from the same brand or try something new), or simply return the car and walk away from the lease. 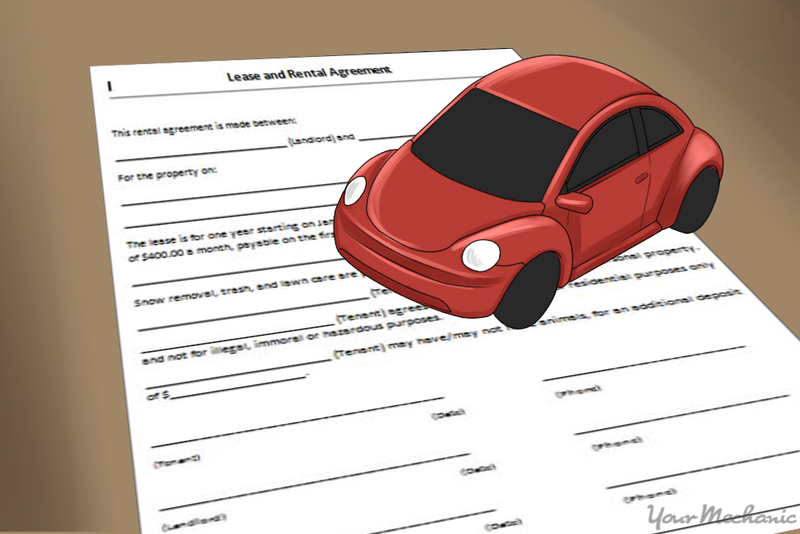 At the end of the lease agreement, you will need to return your car to the dealership. Your vehicle will need to be thoroughly inspected before it is accepted back. 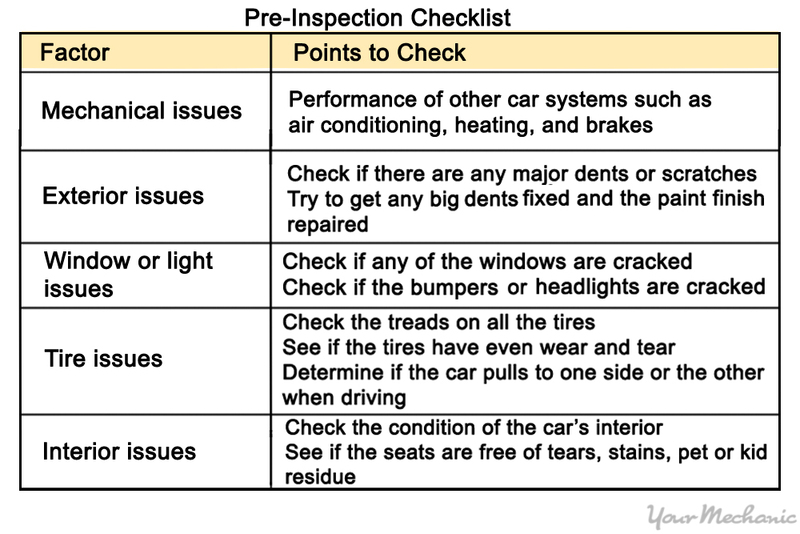 Follow the above steps to prepare for a lease inspection and ensure that your car is in good condition. If you need professional help in checking your leased car, get a certified mechanic, such as one from YourMechanic, to perform a safety inspection as well. Q: Do you do Uber inspections ? ?